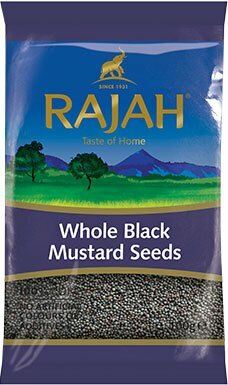 The simple black mustard seed that forms the base for many a tadka in South Asian cooking goes as far back as the Stone Ages. The tomb of Tutankhamen was found to contain whole mustard seeds since the Egyptians used it in their food. Its place in the Indian kitchen is also documented in a story of Buddha during 5th century BC, India. There are various types of mustard seeds and these can be used in many forms such as whole, ground, powdered, or as pastes and oils. The tiny black mustard seeds which form the base of many South Asian dishes are the smallest, most potent and spiciest of the lot. Mustards are winter crops. The plant reaches about 4-5 feet in height and bears vivid golden yellow flowers that are romantically documented as sarson ke khet (mustard fields) in Bollywood films. Its tiny, round seeds measuring about 1 mm in diameter are encased inside a fruit pod similar to the green pea pod. Mustard grows best in rich, well drained soil. To harvest the mustard seeds, farmers leave the stalks on the plant until the pods have dried. Once the pods turn from green to brown, they are hand-picked. Then they are air dried in a warm place for about two weeks. Black mustard seeds must be fried in hot oil to make them pop, releasing their nutty flavour and reducing their inherent spiciness. You can use them to achieve many different flavours in chutneys, curries, pickles, spice blends, and dals. Whole, dry mustard seeds keep well for months at room temperature when stored in dry and humid free conditions in your masaledani (spice box). However ground seeds and other preparations of mustard should be kept in airtight containers and placed inside the refrigerator for a prolonged shelf life. Besides its key role in South Asian cuisine, mustard seeds are used for their medicinal effect. Mustard seeds and oil are traditionally used to relieve muscle pain, rheumatism and arthritic pain. In India, mustard oil is massaged into the scalp and is believed to stimulate hair growth. Its ground seeds act as a laxative, stimulant to gastric mucosa and increase intestinal secretion.